7.20.2013. We were pondering art: Brendan, the expressiveness of gangsta rap; me, the psychological depth of the kind of African art that gets labeled "voodoo" by ignoramuses. So, what is art? If you watch a movie like "Style Wars" (about 1980s graffiti artists in the South Bronx), you see a powerful beauty breaking loose from the chains of poverty and despair. It is a cri de coeur. * Instead of curling into the stupor of hopelessness, subway-painters, sidewalk-dancers, poet-rappers, and turntable-musicians say it loud: I AM! Likewise, people leading subsistence lives in countries like Nigeria, where death from violence or disease lurks behind every bush -- these people know that "taking time" to carve a mask, or hammer iron into a staff, or fashion effigy dolls is not like taking a Monday evening course at the art museum to reduce workplace stress. These people know that pouring your soul into one of these crafts might literally be pouring your soul into the means for your spiritual and physical survival. People can be oppressed in so many ways, and they can be systematically stripped of political and economic tools. But walking among them are always the spirit leaders -- the creative ones -- the storytellers, the poets, the crafters, and the listeners who turn the craziest things into music. They are the resilient ones who rise from despair and bring power back to their people. In communities where artistic expressions emerge as part of the culture, the economies are humble. Money may change hands for specific services, objects, recipes, or gigs. But the system is well integrated and proportional. The arts of the community define "belonging." If an American rapper is lucky, they will get signed to a record label. They will become a famous individual with intellectual property (which may in fact be owned by the record company). A graffiti artist like Jean-Michel Basquiat or a graffiti-inspired artist like Keith Haring may become darlings of the gallery scene, adopted by the the taste-makers of the day. But as soon as their work is sold, it belongs to the marketplace. In the international auction rooms, there is a brisk trade in African masks and sculpture. While the village where the artifact came from might continue to live without clean water and be enfeebled by endemic malaria, a well-publicized mask might yield a hammer price of thirty grand. Yes, there's something about Big Art that bothers me. There's lots of money in it for sure, but the idea of community for the artist and/or the artwork changes. For too many, "community" leaves the neighborhood and becomes the agents and lawyers and market-makers. While a certain proportion of fans will be true believers, who deeply understand the work, too many are just camp-followers, who want to be associated with the latest and greatest. Here is when we start having to question, "What is art?" or possibly, "You call that art???" We have debates over what is authentic and what is fake; what is crass commercialism and what is innovation; who is pandering and who maintains his artistic integrity. As the ranks of pandering commercial fakes grow, we find ourselves in a society where art exists somewhere "over there," in a gallery or concert stage or text book and we rely on the professional critics and academics and media buzz to tell us what we ought to like. This is not to say that serious artists don't rage against each other in bitter competition or protest, but it is in their rage that new art is seeded. It is those of us who dumbly stand on the sidelines, disconnected, chasing one fad after another, probably, in fact, not thinking much about "art" at all -- we have lost a connection and perhaps we need it back. 1: Yesterday we wound up sitting at the kitchen table doing our work. 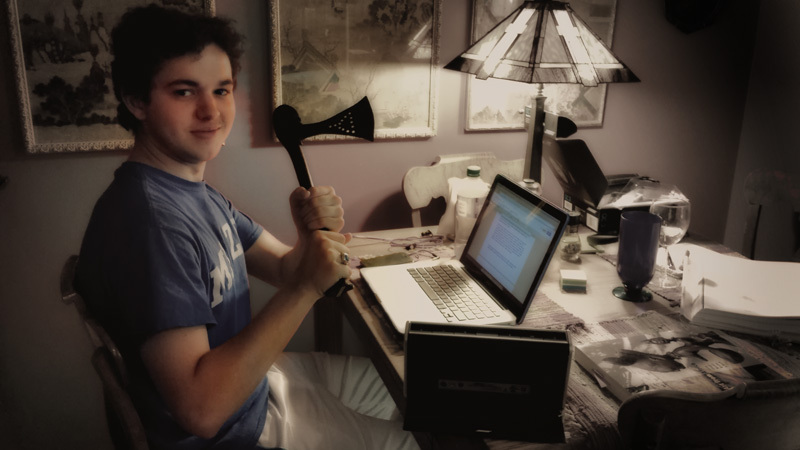 But why is Brendan wielding an axe? *Cri de coeur: French, literally, cry of the heart -- an impassioned outcry. Last night we watched "Copyright Criminals," about audio artists who create using manipulated samples from previously published works. Wouldn't it be swell if the artists could work out deals among themselves that would allow them the kind of intellectual property protections that they want, but also allow them to participate in communities that will make their sound live forever? But ah, communities of artists must deal with the superstructure of corporate control.